I had a passion for anything that flies since I was a kid. Back then I did R/C flying and then in 2006 I became a serious flight simmer. 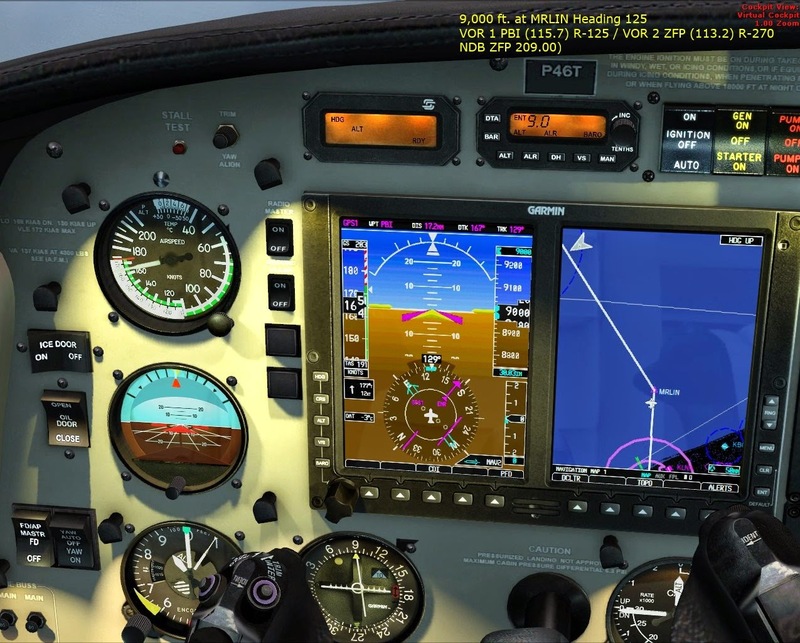 I love aviation and even though I am not a pilot I like to practice navigation and for that reason I have been acquiring some nice IFR rated aircraft for my Flight Simulator X. 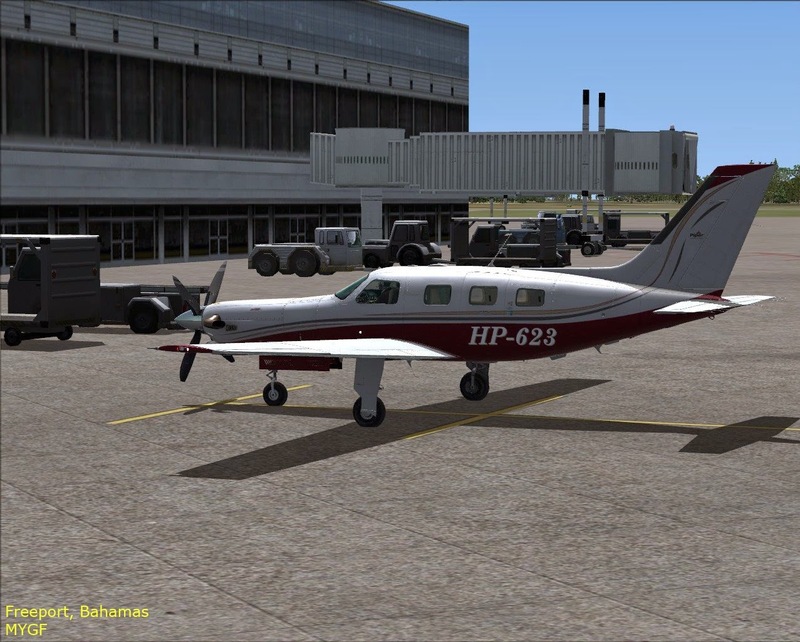 Last December (2013) I bought the Carenado Piper Malibu Jetprop (PA-46T). As a flight simulation enthusiast I am nowadays “grounded” with home airport Marcos A. Gelabert (MPMG) and thought it would be nice to replicate a real life aircraft delivery. So in this installment we will do the the very first leg of a delivery tour for our brand new Piper Malibu Jetprop in Lord of Wings livery. We will take it from the Piper factory at Vero Beach Municipal Airport down to Panama city, Panama in only God knows how many legs. The purpose is to have fun as well, visit new airports, practice lots of IFR and get to know the aircraft. I like to do my flight planning so I used Plan-G to plan my flight. Loaded with the PA-46T aircraft profile. 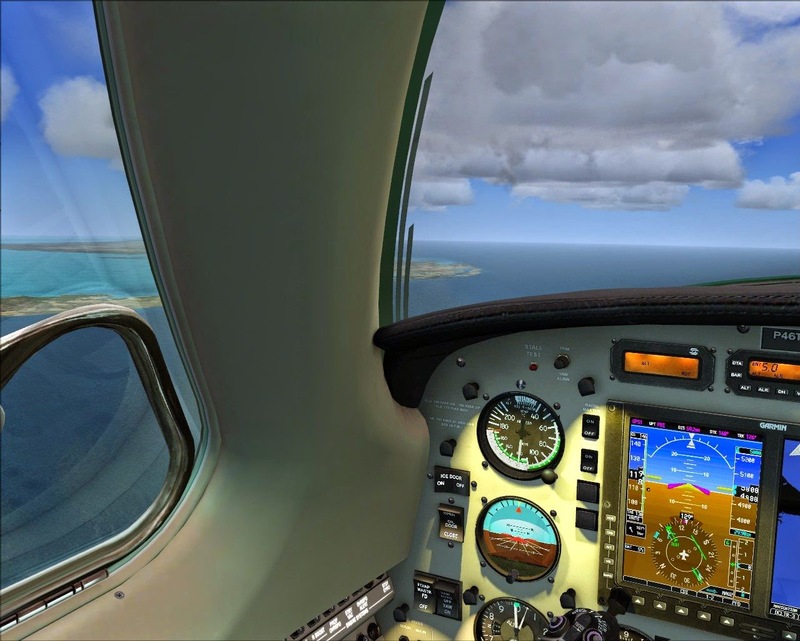 We will fly from Vero Beach municipal airport (ICAO: KVRB) to Freeport, Bahamas. Our cruise altitude will be 9,000 feet (IFR, east bound). For Vero Beach I only found the Aerodrome chart, no departure charts. For Freeport I got Instrument Approach charts. Loaded 137 gallons of fuel and we expect to use 27 gals. Payload is 360 pounds. Our trip will be 144 nautical miles with ETE 01:12. Alterante airports MYAT and MYGM. So basically winds 060 degrees at 8 knots so we get runway 04. Scattered clouds but good visibility. Set the altimeter, flaps 10 degrees. On our Garmin GNS530 we set our NAV1 (VRB 117.30 – Vero Beach) On the Garmin 500 Primary Flight Display I set the heading but to 198 more or less pointing to WUBUR intersection, our first waypoint, the Course Indicator to track VRB R-164 outbound, Altitude to our initial climb of 5,000 feet. On the Garmin GNS430 we set NAV2 to Palm Beach (PBI 115.7), Flight Director on, connection to IVAO but unfortunately no ATC coverage on the network. An uneventful take off with slight rain, turned left on initial climb to 5,000 feet with Vero Beach municipal airport on our left. Getting the hang on the Carenado PA46T which may be wild at takeoff/climb if you give it too much power. 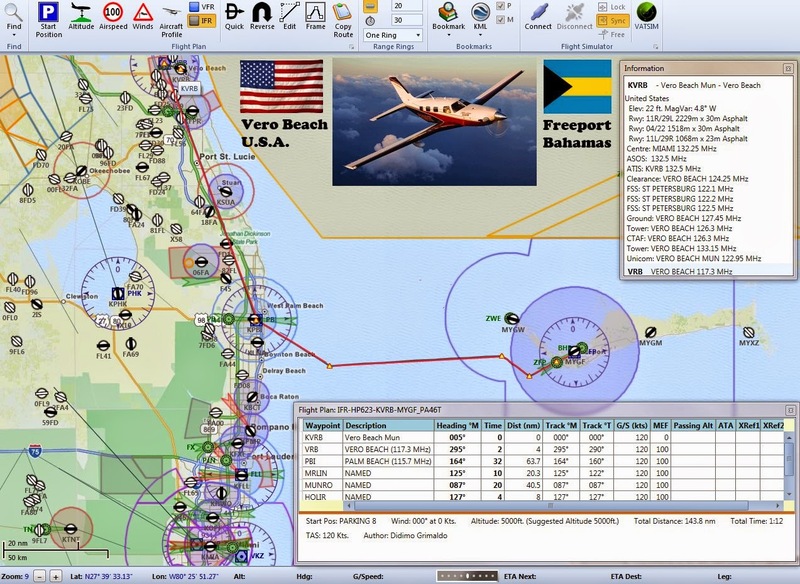 We will be heading to WUBUR intersection which is our first waypoint in the flight plan and initiates our navigation along the V3 airway outbound from VRB to PBI via SMUGS and MORGA intersections straight ahead with the coast of Florida on our left. Once I was more or less at WUBUR I engaged the Autopilot to hold climb from our initial 5,000 to our cruise altitude of 9,000 feet so we are climbing with Fort Pierce on our left. While I do other preparations for the flight I also set the AVSS to hold the course tracking VRB-PBI along V3. If you want to do real navigation with the Carenado Malibu you have to be a bit ingenious as the virtual cockpit is not very readable, so I docked the PFD and the GNS530 on a 2nd monitor but soon you find out that while you can operate the buttons on the docked panel, operating the rotating knob to adjust HDG/ALT/CRS will result in nothing being updated. I think this is a serious bug in the Carenado Malibu but experience has shown that while they release planes often, they seldom iron out most of the bugs reported by users in the "Unofficial" Carenado forum. There is no "Official" Carenado forum which is very strange way of supporting customers. Okay we are now cruising at 9,000 feet, I don’t want to fly too low over water as I can’t swim. After passing West Palm Beach VOR (PBI) we turned left outbound R-125 on airway BR54V towards MRLIN intersection. The navigational challenge for this flight is this intersection. For that we have changed our navigational setup with PBI set on NAV2 (GNS430) with OBS 125 and our destination Freeport VOR/DME (ZFP 113.2 – Freeport) on NAV1 (GNS530) with OBS 090 (radial 090 inbound ZFP). So, we should be at MRLIN when the CDI aligns on the PFD (NAV1) as well on the VOR2 (NAV2) which is kind of hidden behind the virtual joke. Kind of a Carenado nuisance but doable. MRLIN is 20nm outbound PBI and 57.3nm from ZFP. The picture on the right shows when we are a couple of nautical miles near MRLIN, as you can see I had to move the yoke out of the way (for that I had to put the AVSS on either heading hold or course hold). The VOR2 shows we are nearly aligned (nearing intersection), the indicator on the PFD unfortunately was set to GPS (magenta) instead of VOR, and therefore it is not showing the alignment I wanted to show at the time I took the screenshot. As a preparation for the next phase of flight I have also tuned the ADF to the Freeport NDB (ZFP 209.00 KHz). NAV1 is as mentioned, set for the Freeport VOR/DME as active frequency (for tracking MRLIN as well) and on NAV1 standby I have already put the Freeport Localizer (IZFP 109.70). Past MRLIN intersection we turn left heading 087 degrees for a 40nm leg to MUNRO intersection on the BR64V airway. Planning to pass MUNRO at 5,000 feet. At MUNRO continued R-090 inbound Freeport. 12nm from Freeport we turned right for the 12nm arc towards HOLIR interception where we should be at 2,000 feet as we intercept the Freeport ILS to runway 06. That got a bit tricky because I did not go through the VRB VOR/DME on departure so the GPS kind of skipped it and lost tracking. I tried to change the active leg on the GPS with no success. I don’t know if that is a Carenado bug or what. 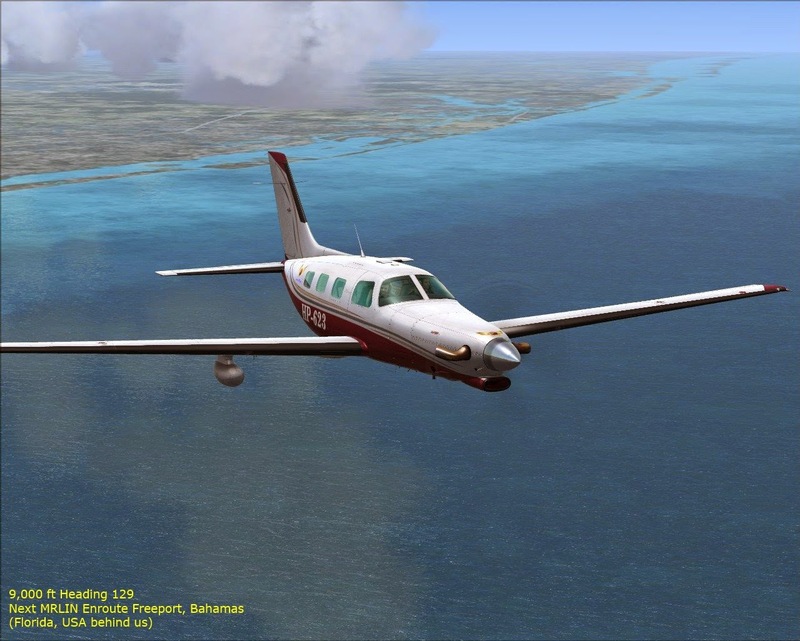 As we finish our 12nm DME arc we find ourselves at the 064 radial of the ILS 06 at Freeport, Grand Bahamas (MYGF). Please do remember, the charts I got as well as the descriptions are for simulation purposes only and therefore not current!. 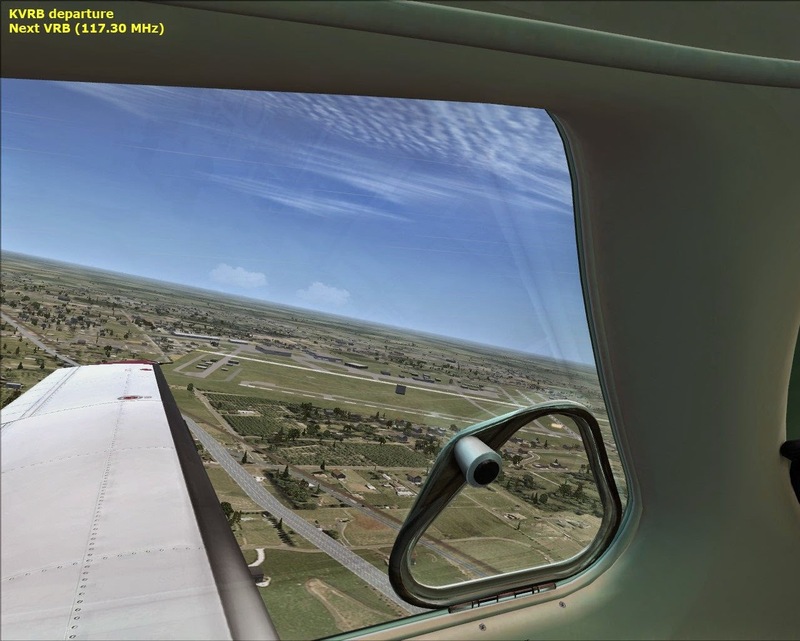 I could not find any decent scenery for FSX for Freeport. This was my 2nd time on this “virtual” airport. 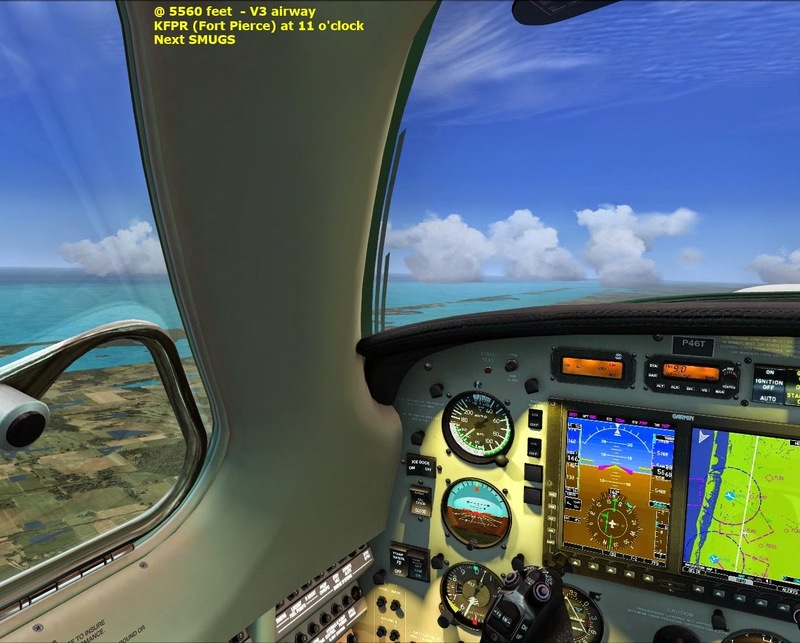 My first time was years ago with a virtual flight from Miami (KMIA) with thunderstorm and doing my first flight simulation video. Landing was kind of okay but not perfect. I used REX Latitude to grade the flight but forgot to add the correct aircraft profile so even though my landing speed was right on the spot, it said it was too slow. Approached at a descent rate of –504 feet/minute and landed at –165 feet/minute at 85 knots. Used up 26 gallons of fuel as expected and completed the flight on time as well, great! The next leg (#2) of the delivery tour will be from Freeport to Nassau, just slightly shorter hopefully with more challenging weather. Leg #3 will take us to Cuba. visit www.facebook.com/lordofwings if you are interested in flight simulation.